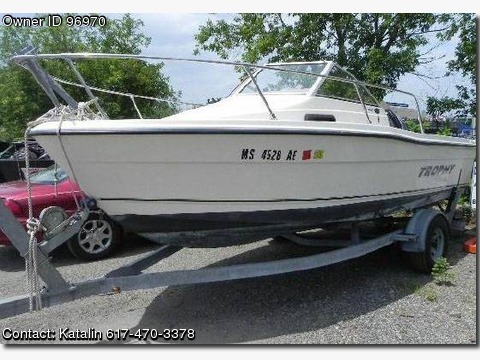 Please call boat owner Katalin at 617-470-3378.8 foot Trophy Motor boat Model 1802, with 115HP Mercury 4 stroke engine, speed 29.7mhour. Has a sleep in cabin for two. Purchased new in 2002, used 5 summers both in ocean and lake, has not been in the water for 3 years. Trailer purchased new at the same time is included. Has been cleaned and detailed professionally before being winterized and shrink-wrapped last fall. Valued at 15,000, asking 12,500.